Solution Selling – Dead Or Alive? Buyers still need solutions right? Well, of course they do. Indeed, they want better solutions than ever before and they want a better price too! The only problem is that they don’t necessarily need or want the sales and marketing that goes with them. This paradox is at the centre of a new controversy in selling – one that claims Solution Selling is dead. Who Says Solution Selling Is Dead? Our peers at Corporate Executive Board have called time on solution selling. As far as they are concerned it is dead. 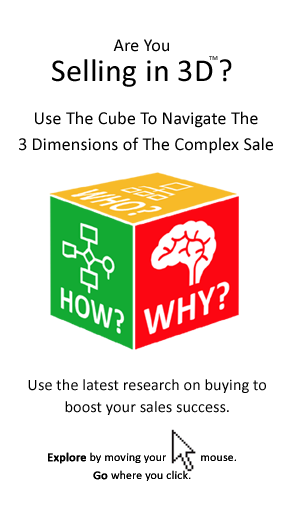 Quite simply buyers can define their own solutions and are increasingly only calling the traditional salesperson when all that is left is to get the best price. Now it is not the first time that selling was pronounced dead. Marc T Miller and Jason Sinkovitz wrote a book provocatively titled ‘Selling Is Dead’ in 2005 (you’ll find a review we did of it some years ago here). This time the obituary for selling has been picked up all across the Internet – you will find million of pages today if you put ‘solution selling is dead’ into Google. The Corporate Executive Board say there is life after death however. It is to move to the insight mode of selling, challenging the buyer with insights into problems that they did not realize they had, or solutions that they have not been able to devise for themselves. Who Says Solution Selling Lives? But not everybody believes it is time to bury solution selling. For example Dave Brock makes the case passionately for solution selling to be allowed to grow old gracefully. His comments led to a raging debate by others such as Charles Green and the authors of the original ‘Solution Selling Is Dead’ article. Inevitably claims will arise that those who want to put the lid on the coffin of solution selling simply want to inherit its riches. After all they have a new methodology to sell. Incidentally the Solution Selling (TM of Sales Performance International) methodology was generating more than $2.9 million in annual royalty income way back in 1999 when it was sold by its creator Mike Bosworth. Are We Going To The Funeral? We like a good headline and to stir it up – least as sales professionals we become complacent – however it is important to look beyond the headlines. Solution Selling means different things to different people. That creates problems in proclaiming that it as either dead, or alive. There is of course the Solution Selling methodology trademarked and owned by Sales Performance International. But we have seen some salespeople apply solution selling methodologies to really connect with buyers, while others used it (in it’s less that pure form) to push products and services as before. How pure is the version of solution selling you are applying? The same can be said of the Challenger methodology I am sure – how it is applied or interpreted is very important. For example its use of terms such as teach and control in respect of the modern buyer could easily be misunderstood even misapplied. What do buyers think about whether solution selling is dead or not? As Buyer Insights is dedicated to bringing a buyer perspective to selling we asked buyers that question. The answer: Well, it seems they (buyers) don’t really care! You won’t find it make the headlines of the magazines, articles and blogs read by professional buyers. 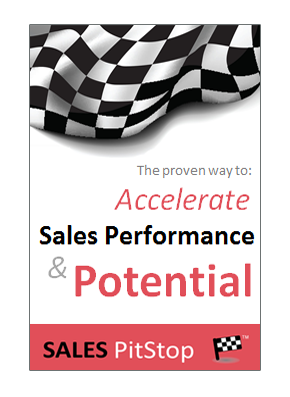 It is only to the sales community that the life or death of solution selling seems to concern. Buyers are focused on buying – the selling is only a side show. It was never about the salesperson, it was only about the solution and the results achieved or problems solved for the buyer. Is how you sell really all about the customer and his, or her needs? If the buyer perceives that the salesperson and the associated sales and marketing are an impediment to getting the best solution then that is a real problem. If salespeople are waiting for buyers to call up saying they have a problem then that is a problem too. Our research with buyers sums up the challenge well – here we have used the off-side rules in sport and the idea of getting a better grip on the sale to make the point. The proclamation of the death of Solution Selling has caused a heated debate, like few other sales topics in recent years. That has got to be healthy, but from all the different points of view, let’s see what we can all agree on. How many of the following statements of ‘sales reality’ do you agree with? In our conversations with sales practitioners and sales experts on both side of the dead-alive debate we believe there is more that unites rather than divides. 1. Changed market conditions and changed buyers requires a changed approach to selling. The effective campaigns and strategies of 3 or 5 years ago can struggle in the context of slower growth and increase buyer sophistication. 2. Buyers are more independent and self-contained that ever before – one measure of this is that they are seeing fewer salespeople and seeing them later in the buying cycle. One implication is that access is more difficult to secure, buyers are slower to respond to seller emails and voice messages, while engaging with the senior cross functional managers is difficult. Do your customers see you as a salesperson, or an expert and trustworthy advisor? 3. Competitive tenders are on the rise, that means getting involved earlier is important. Leaving it until the buyer calls means that the decision is made and price is the only issue on the table. Sellers can’t just sell to those who are in shopping mode, it is important to generate demand and sell to the customers of tomorrow. How effectively are you selling to the customers of tomorrow? 4. Sellers need to be careful in saying that buyers have already made their mind up. Although it is more difficult to influence the buyer and define the solution if involved later it is always the sellers objectives to influence and persuade right up to the very end. After all, we see time and time again how deals can change (including stalled decisions and u-turns) at any stage. The amount of time required for information gathering and analysis (a key factor in slower decisions). Analysis paralysis, or information overload. The validation of the information gathered from sources such as Wikipedia or even some Analyst reports. There is no reason why sellers cannot move some way to restoring their role as trusted information brokers. In particular they can act as a conduit to insights and information around customer success – the most powerful of all sources. While buyers are increasingly scoping, if not defining, solutions by themselves, a salesperson with all his, or her years of experience across a diverse customer base, must be able to bring some new information, or insight to the table. Are you perceived as a valuable information broker by your prospects? 6. The solution to the problem is not simply a sales one, it requires a new blend of sales and marketing. But it also requires other parts of the business too. For example there is no point in selling a solution and then delivering a product. The new solution selling must integrate solutions marketing, solutions product management, solutions delivery and solutions customer support. It is not just about selling. It takes an organization to sell and deliver solutions. So it is not just about the sales person, but the very fabric of the organization. Required are new product/service offerings, new sales tools, new marketing, new compensation structures, new expertise and new modes of delivery. Is your organization really geared up to sell solutions, or is it still a product or services company? Navigate the increasingly demanding requirements of their internal buying/approvals process. Justify the decision, including building a compelling business case that considers costs-benefits, risk, etc. Interface effectively with procurement and to access and engage with increasingly cross-functional buying teams. Solution selling dead or alive, does it really matter?